"Changing the World, Building New Lives"
Lesbian Mothers and Friends at McClures Beach. Marin County, 1973. Kate (in the tee shirt with lesbian symbols) speaks of the Lesbian Mothers Union. "The Lesbian Mothers Union was founded at a workshop at the first West Coast Lesbian Conference. Over 2000 attended the conference at UCLA. "We were so happy to meet other lesbian mothers, but we also met a lot of overt hostility from other lesbians. When we asked for more childcare, lesbians yelled at us, 'You should have thought about that before you fucked him'. Our first meetings in the Bay Area were at Del Martin and Phyllis Lyon's house. We never really did much, but we were all empowered by it and our extended friendship circles were lasting. "(Kate Kauffman, formerly Kate Dolin). Luca, Jeanne, Johnny. Berkeley, 1977. Jeanne Jullion spent her junior year of college in Florence, Italy where she met and later married her Italian husband. They returned to the U.S., had two sons, the youngest of whom was two, before Jeanne recognized that she was a lesbian and could not longer be a conventional housewife. The separation seemed cordial at first. Her younger son, Johnny, lived with her. Luca, her older son, lived with his father nearby and there were visits back and forth. Eventually, concerned about the paternalistic values with which her older son was being raised, Jeanne tried to gain custody of seven-year-old Luca. Her husband countered with his own request for custody for both children citing Jeanne's lesbianism. In the face of a conservative judge and a family court services investigation that included blatant anti-gay questions, Jeanne took her case to the streets. She was transformed from a shy housewife into an eloquent speaker for the rights of lesbian mothers. 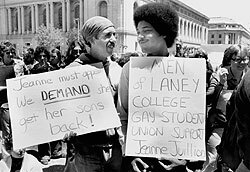 Men of Laney College Gay Student Union Support Jeanne Jullion. Civic Center, San Francisco, 1977. As dreaded, she lost custody in the preliminary court proceeding. Without notice, and in her absence, four-year-old Johnny was taken from her home by the police. After months of waiting, her appeal was denied. However, the pressure her case brought on the court forced the beginning of a re-evaluation of homophobic policies. At the final trial she was evaluated primarily on the basis of her parenting, and was awarded custody of Johnny and visitation with Luca. Tragically, against Jeanne's protests, the judge allowed the father to take the boys to Italy on a vacation. He never returned. It took nearly four years and a harrowing "kidnapping" before Jeanne was able to bring Johnny to live with her. Luca remained in Italy. The full story of Jeanne Jullion's case is beautifully told in her book, Long Way Home (Cleis Press, 1985). Jeanne Jullion. 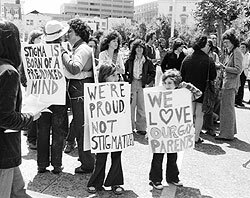 Support Rally, Civic Center, San Francisco, 1977. Jeanne speaks in 1994: "Luca is 25 and does computerized accounting for an Italian bank. As he was growing up I visited him and we talked on the phone, but I wish I'd gone more often. He and John are extremely close. My parenting of John was conducted in considerable isolation, with very little information. A chorus of voices of my family, church and the judge accused me of being driven by my own selfish agenda. I feared I would hurt this boy-child in some deep way. John and I would come upon a new age of his human development and it was all fresh territory. I wish I had known then that it is truly all right for us to raise our kids." John, at 21, stated in a radio interview that he doesn't feel all that different from his other male friends, that they all are having to figure out how they want to be men.